Over a period of 4 days, Salesforce.com hijacks the city of San Francisco for the annual Dreamforce conference. Salesforce transforms the city as well as the Moscone Center into a marketing animal by littering billboards, bus stops, and light poles with Salesforce advertising. Each year, the attendance grows by double figures leaving tens of thousands of cloud evangelists to spread the good word of SaaS and cloud computing. Salesforce CEO Marc Benioff and his team go out of their way to top previous years, and Dreamforce 2012 will be no different. Without a doubt, this is one of the largest, craziest, and most energetic conferences you will ever attend. This will be my third year attending Dreamforce and at just under two months away, my anticipation is already starting to build up. Having attended several Dreamforce conferences in the past, I’ll walk you through what to expect, what to do, and of course, what not to do. Lets start with a quick overview of past Dreamforce conferences. You can see the Dreamforce conference continually delivers a solid line-up of speakers, rockstars (literally), and buzz generating announcements. So what should you expect? Prior to the Dreamforce 2012 conference, you can expect to be overwhelmed with information, options, and decisions. Registration, session schedule selections, booking travel, airport security, and a crazy taxi ride to your hotel are the first items to mark off your list; this is just the beginning. If you stay in one of the popular hotels riddled throughout Union Square, you will most likely have less than a mile walk each day to the Moscone Center. Don’t worry though, you will be walking on flat streets vs. the steep hills San Francisco is notorious for and you’ll have plenty of [homeless] friends to keep you company along the way. Salesforce usually offers a comped breakfast and lunch, but don’t miss the opportunity to eat breakfast at one of the popular hot spots. As you approach the Moscone Center, you will immediately be hit with a sense of awe. If the growth rate is similar to previous conferences, you will be joined by +58,000 Salesforce enthusiasts. Thousands of those attendees will be scurrying about the walk ways and you’ll most likely see Salesforce rivals (i.e. Oracle) displaying some form of protest. If you didn’t check-in the day before, you will need to wait in line to check-in and pickup your Salesforce pass and materials (usually a pad for notes, a conference map and sponsor info, a pen or two, buttons, and other tchotchkes). You are now ready to attend the kickoff keynote session. Take the escalator down to the Moscone Center’s first floor and you will be ushered to seating. A lot of folks opt not to attend the first keynote, but I think it is valuable enough to wake up bright and early. Besides, they usually hand out free t-shirts at the door. I hope you brought that extra suit case! After the keynote, you’ll be pumped to see how the rest of the Dreamforce conference unfolds and after the first day, you’ll start to get the hang of it. Keynotes, sessions, hands-on exercises, networking, and walking through hundreds of vendor booths will become second nature. You are now a Dreamforce machine. Prepare before you leave. Map out where you want to eat, where you intend to grab a beer, etc. You’ll have little down time, but just in case, write down a few popular tourist attractions that interest you (i.e. China Town or Fisherman’s Wharf). Along the lines of “prepare”, book your hotel immediately! Over 40,000 attendees will require a place to stay and hotels are selling out quick. I prefer to stay at the Westin St Francis, but the demand drove the price above my company’s “approved amount”. This year, I’ll be staying at the Sir Francis Drake. You do not want to be in the position where you have to catch a cab to-and-from your hotel and the Moscone Center. Also, many San Francisco hotels do not have central air conditioning so take this into account during your hotel hunting. Check-in as soon as possible, preferably the day prior, to avoid waiting in line. Grab breakfast on your way to the Moscone Center. I’ve made it tradition to have breakfast at least once at Lori’s Diner in Union Square. One of my personal favorites is their corned beef hash. Download the Dreamforce mobile app. This app will come in handy as it contains your session schedules, maps, and more. Attend the keynote sessions. This year’s keynote speakers include General Colin Powell, the CEO of General Electric and Burberry, and Richard Branson. Even though Salesforce CEO Marc Benioff has a tendency to rant a bit too long, the tidbits of information coupled with insight provided by some of the world’s top business leaders makes it worth your time. Remember to take a few notes you can share with your work colleagues upon your return (to show you weren’t just pounding free booze the whole time). Presentation sessions are great, but hands-on sessions are even better. Even if you are a business guy in mid to upper management, it will be a great learning opportunity to see what happens behind the scenes. Additionally, there will be several “meet the Salesforce Team” sessions where panels of Salesforce experts will discuss their roadmap and answer your burning questions. Stumping the developers is usually rewarded with a hat or t-shirt. Network! I am guilty of being an introvert myself. Dreamforce is not the place to be a recluse. I’ve made some great connections at Dreamforce and you should as well. You never know when that connection will come in handy. If you drink and you are staying at a Union Square hotel, pickup a 12-pack of water at Walgreens. Stay hydrated and keep that hangover in check. Speaking of drinking, use your LinkedIn profile to register for dozens of Dreamforce after party’s. In an attempt to woo you, Partners of Salesforce throw bugo-bucks into these after party’s. Pre-registration is almost always required and public walk-ins will be turned away. Attend the Global Gala Concert. Dreamforce 2012 will have the Red Hot Chili Peppers. Did I mention free food and beer? Don’t feel obligated to stick to your agenda 100%. If you come across something interesting, go with your gut. Most of the presentation style sessions are pretty dry. Salesforce records all sessions and makes them available after the conference, so you can always catch up later on what you missed. Stay away from the Tenderloin District. Keep your drinking under control. You’d be surprised how many business professionals miss these words of advice. Union Square lacks a sense of safety after midnight. Prostitutes find their way into hotel lobbies and drug dealers roam the streets. In a true Marc Benioff-like fashion, I ranted well beyond what I intended. I hope this information helps those that will be attending Dreamforce for their first time in September 2012. I’d love to meet CrashCloud readers. Please use the contact form on this site to get in touch. For those that have attended past Dreamforce conferences, please feel free to leave comments with your own tips and/or advice. Newbs, your comments are welcomed as well. Another tip: It’s really tough to find a place to open up your laptop, have a quick meeting, charge your phone or even get coffee without standing in line for an hour. We’ll have a huge event going on across the street at 678 Folsom Street with FREE wifi, desks, couches, coffee and food for all attendees. Stop on by to relax or work! Welcome Michelle! Thanks for adding this and count me in. I have a Droid 4 and I’ll definitely need a place to recharge as I can’t bring a spare battery (battery is built into phone). Last year I couldn’t find a coffee to save my life without hopping into a cab and leaving the whole Moscone area!!! Starbucks, forget about coffee… and a plug was nowhere to be found anywhere. I imagine with 50,000 people it’ll be even more difficult. Hi Steven, I couldn’t agree more and actually had several similar experiences last year. I just reached out to Michelle from desksnear.me for details about their Dreamforce crash pad. Check back in the next few days as I intend to write a post about this “Dreamforce 2012 Hangout”. Thanks for all the info. I am the only person being sent to DF from my company, and as the youngest one working here (23) this is a big event for me! Your articles have been great. Hi Matt. Good to hear you are the lucky one that gets to attend from your company. Feel free to reach out as I’m really looking forward to meeting new people this year. I’m also glad to hear you like the posts. Check back often or sign up for email updates (top right corner of site). 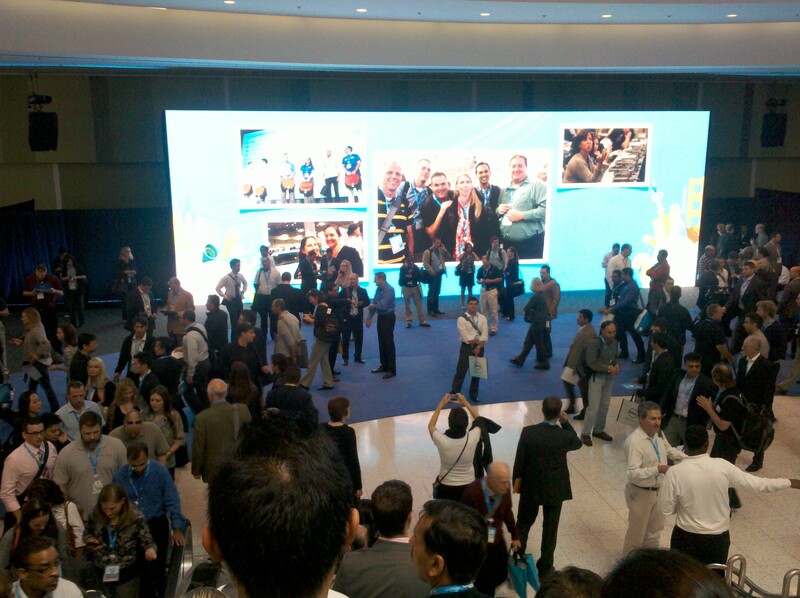 I plan to squeeze in a few more Dreamforce 2012 posts over the coming weeks.